Design the 25th anniversary logo and jersey! 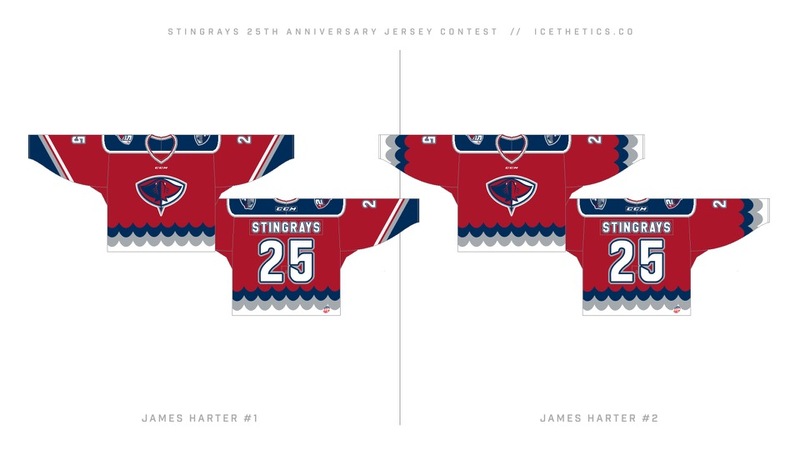 Oct 3 · The South Carolina Stingrays have selected five finalists for their 25th anniversary jersey design contest so it's time to vote! "We were once again thrilled and astonished by the quality of submissions! 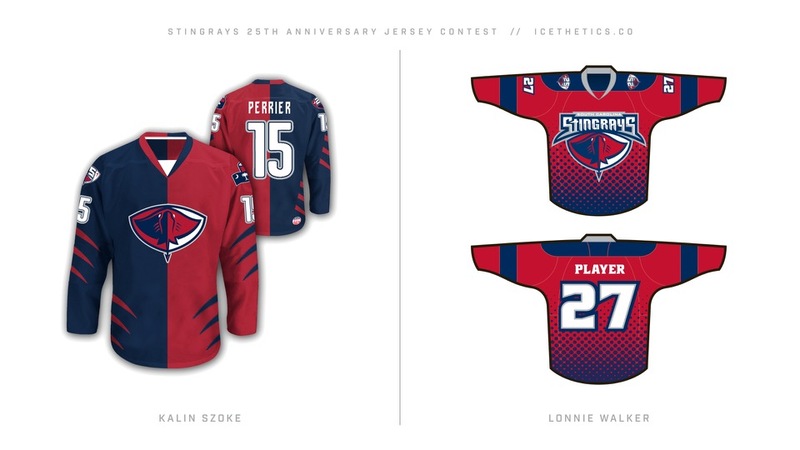 Choosing the final jersey options was even tougher than the logos," said Jeffrey Zucker from the Stingrays ownership, "but we are very happy with the finalist options." Congratulations to Chase Carlson, Adam Del Monte, Dale Hammerly, Benjamin Rajaobelina, and Will Sinnott! Click image below to enlarge. Scroll down to vote. We're changing up the voting process this time around. To ensure every finalist gets a fair shot, we're doing a round-robin style mini-tournament. Every finalist will face every other finalist in a series of 10 polls this week. Oct 6 · The first five polls are complete. The next five are right here! Match 6: Which jersey design do you prefer? Match 7: Which jersey design do you prefer? Match 8: Which jersey design do you prefer? Match 9: Which jersey design do you prefer? Match 10: Which jersey design do you prefer? In case you're curious, I wanted to acknowledge and explain some changes made to the original entries. The Stingrays decided that their primary logo should be used as the crest and the new 25th anniversary logo should be used as a patch on both shoulders. This was applied to all finalists. The team will not be able to use custom equipment. They will use their standard helmets, gloves, socks, and pants. As such, these customizations were removed from the entries. They're also unable to do the ghosting features of Will Sinnott's original design, so that has been removed. Stingrays players prefer not to wear jerseys with collar ties so the collars have been converted on all finalists. Lastly, all finalists were converted to the standard CCM jersey template to better represent the final product. Sep 26 · The jersey entry window has closed and we received more than 50 designs! See them in the gallery below. The Stingrays are in the process of choosing their finalists this week. On Monday, Oct. 3, the final jersey vote will begin. Sep 6 · The logo entry window has closed and some great designs were submitted. Check them all out in the gallery below! The Stingrays are in the process of choosing their finalists. On Monday, Sept. 12, voting will begin! Sep 19 · It's official — the South Carolina Stingrays have unveiled their 25th anniversary logo! The design by Brooks Freeman earned the most votes in the poll conducted here on Icethetics last week! That means the jersey portion of the contest is now underway! Click here to download the logo and start designing your jersey. Entries must be submitted by email to icethetics@gmail.com by this Sunday, Sept. 25 at 8pm ET to be considered. Your name and email address must be included in the image. Once again, the Stingrays will select 3 to 5 finalists before voting begins. 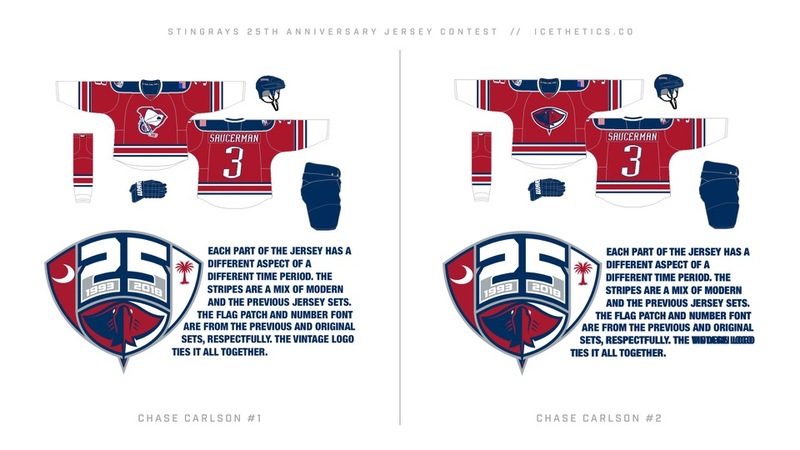 Sep 12 · The South Carolina Stingrays have selected four finalists for the 25th anniversary logo design contest and your vote will help determine the winner! Entries from Brooks Freeman, Scott Markiewicz, Matt McElroy, and Rene Sanchez have been included in the voting process. The winning design will be used on the alternate jersey and other merchandise. 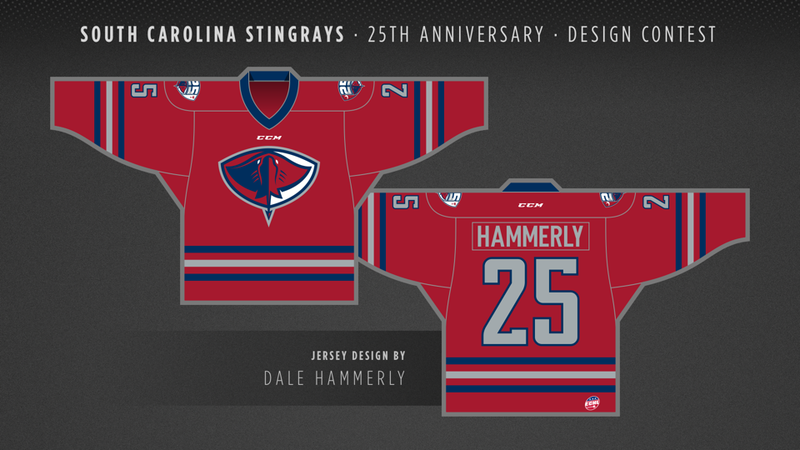 Which 25th anniversary logo should the South Carolina Stingrays use? Results will remain hidden until voting ends. Then the winning design will be revealed on Monday, September 19! 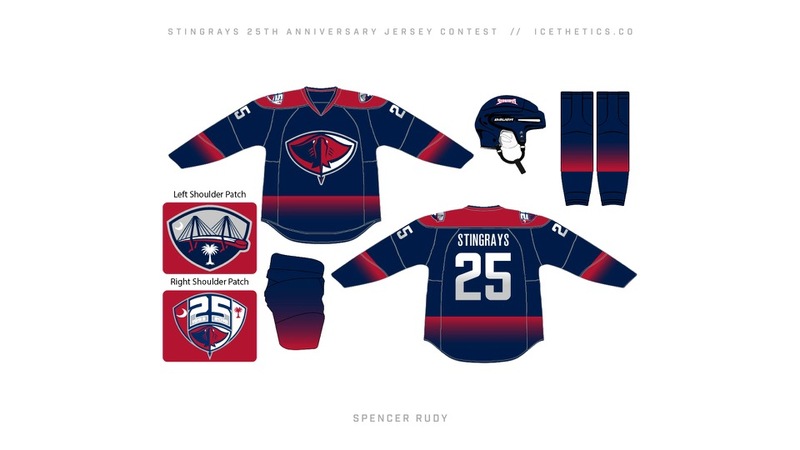 "We want to thank Chris and the Icethetics community for the incredible response to the contest," said Jeffrey Zucker of the Stingrays ownership. "We are overwhelmed by the quality of submissions, and it was difficult to choose finalists. "Ultimately, we picked logos that we thought still 'felt' like our brand and honored its history while also being creative. We look forward to fan input and are excited to see what Icethetics readers select!" Lastly, the Stingrays also wanted to recognize one more design that was almost selected as a finalist. They loved the brilliant logo Daniel Otters created. 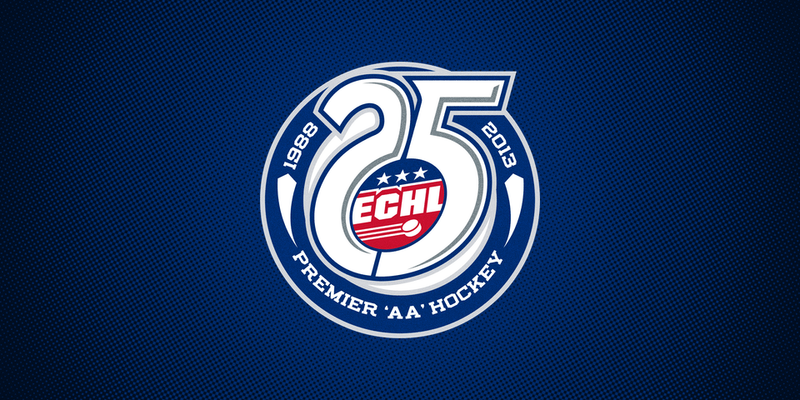 The only thing that stopped them from including it was its slight similarity to the ECHL's own 25th anniversary logo. As Jeffrey said, there were so many incredible designs submitted to this contest. I know it was a difficult decision for the Stingrays. They and I are extremely grateful to everyone who participated. I think we have a superb group of finalists but I, personally, wanted to give shoutouts to a few more designers who did truly outstanding work. Some of my favorites that didn't make the final cut came from Patrick Brickman, Hayden Duench, Mark Morgan, and Justin Wright. 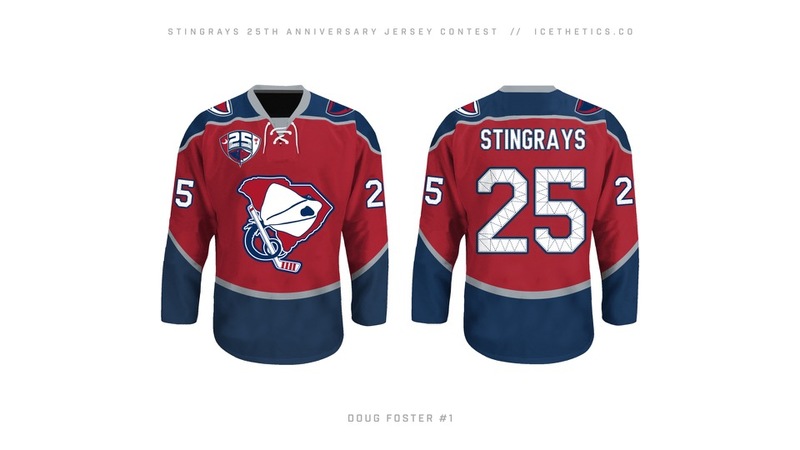 I'm excited to see which logo Icethetics readers choose to represent the Stingrays' silver anniversary! Aug 24 · Get ready for something exciting! The ECHL's South Carolina Stingrays are celebrating their 25th anniversary during the 2017-18 season. 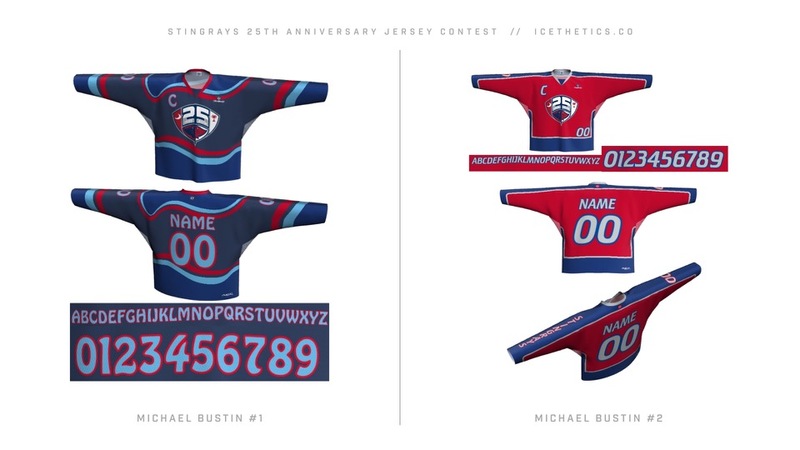 To mark the occasion, they've enlisted Icethetics to host a contest allowing fans to design a special logo and uniform! Obviously I was thrilled by the idea! We're splitting the design contest into two parts — first a 25th anniversary logo, then a jersey to be worn as the team's alternate in 2017-18. Artists will submit their designs and the Stingrays will choose a handful of finalists. Then the winning design will be determined by a vote of the Icethetics community! The winner(s) will get a free customized jersey, tickets to see the Stingrays playing in their jersey, and up to $500 to cover travel expenses! Aug 24–Sep 5: Artists may design and submit their 25th anniversary logo designs. Sep 6–11: Stingrays will select 3 to 5 finalists. Sep 12–18: Icethetics readers will vote for the winning logo from the finalists. Sep 19: Stingrays unveil 25th anniversary logo! 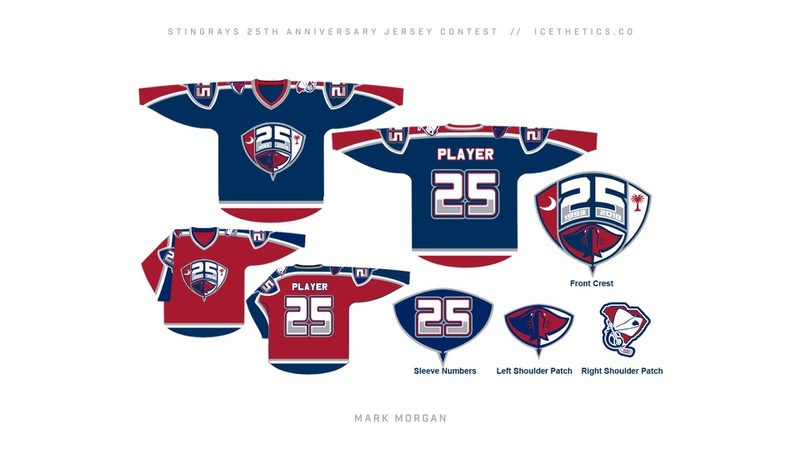 Sep 19–25: Artists may design and submit their 25th anniversary jersey designs. Sep 26–Oct 2: Stingrays will select 3 to 5 finalists. 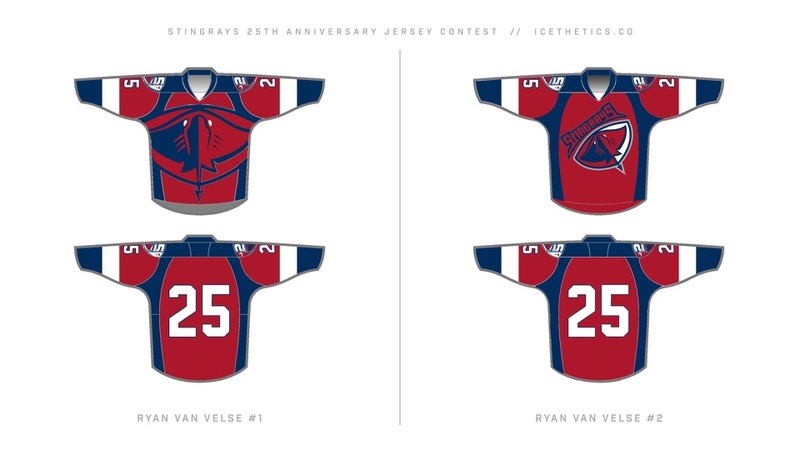 Oct 3–9: Icethetics readers will vote for the winning jersey from the finalists. 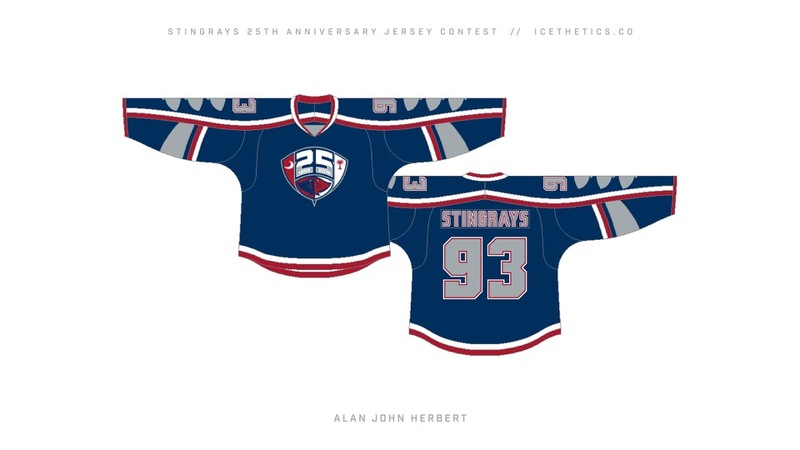 Oct 10: Stingrays unveil 25th anniversary jersey! If it seems early to be designing logos and jerseys for the 2017-18 season, bear in mind that manufacturers need lots of lead time to produce jerseys and merchandise. 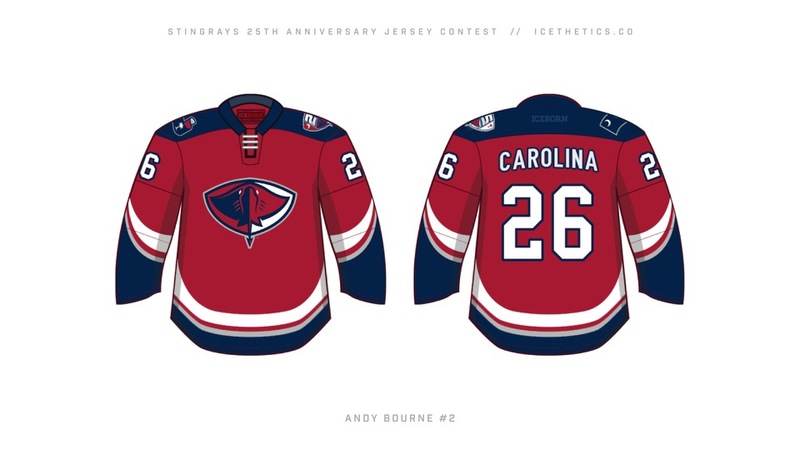 Design an original logo and alternate jersey to commemorate the 25th anniversary of the South Carolina Stingrays hockey club. 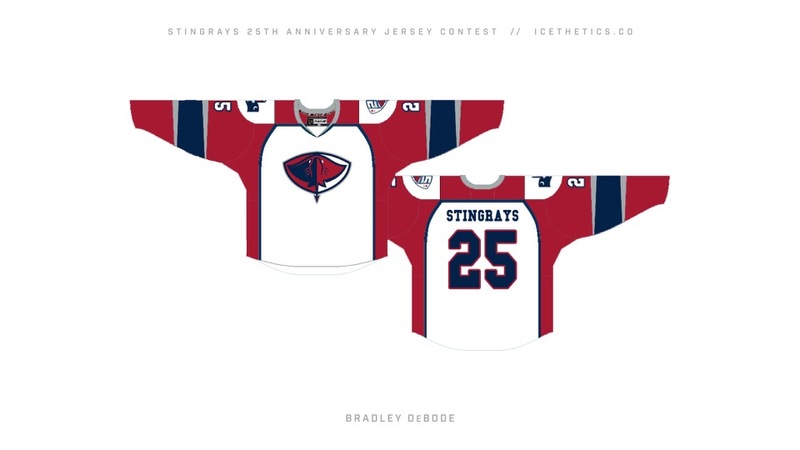 Do not submit any past or present Stingrays jersey designs or any artwork not created by you; the anniversary logo may incorporate elements from past or present Stingrays logos. Jersey must be dark — navy blue or red preferred. Artwork must be sent to icethetics@gmail.com before the deadlines. 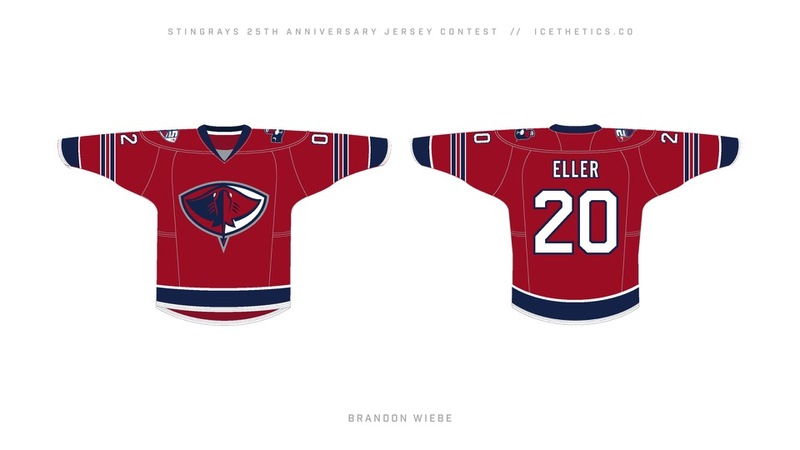 Please do not submit jersey designs until after the 25th anniversary logo has been unveiled. Your jersey must use that logo. There is a limit of 2 entries per designer for each contest (meaning: 2 logos and 2 jerseys). 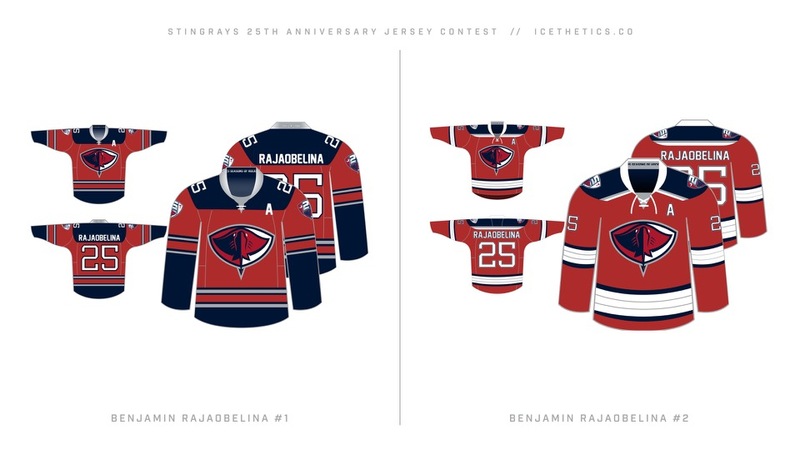 Following the submission deadline, Stingrays staff and ownership will select 3 to 5 finalists, from which the winning design will be determined by a public vote conducted at www.icethetics.co. 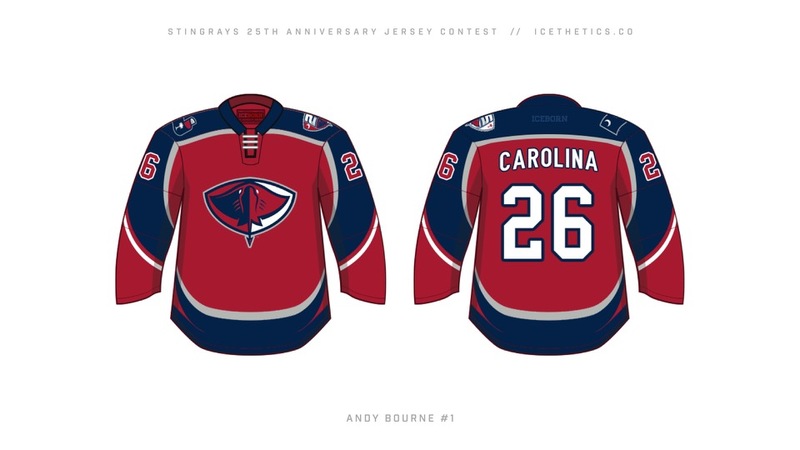 Winning logo and jersey designs will become the property of the South Carolina Stingrays, who reserve the right to modify winning designs. All finalists will receive merchandise featuring the winning 25th anniversary logo. 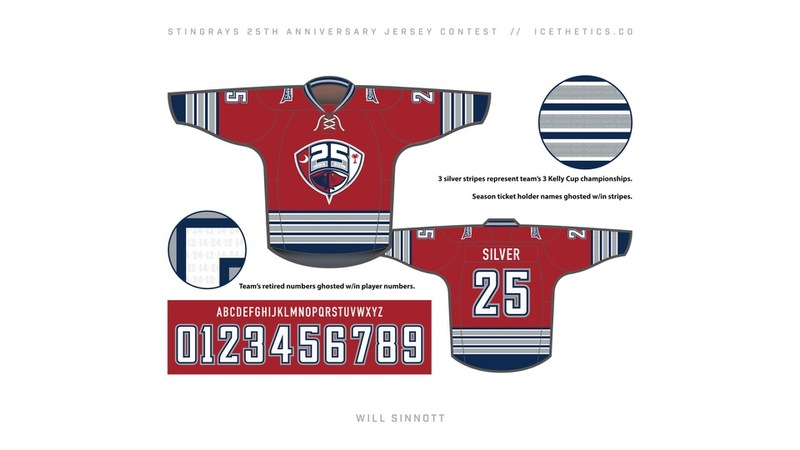 Winning designers will receive a customized version of the 25th anniversary jersey, tickets to the game in which the Stingrays will be wearing the jerseys, and a $500 travel stipend. I can't wait to see the entries. Good luck! 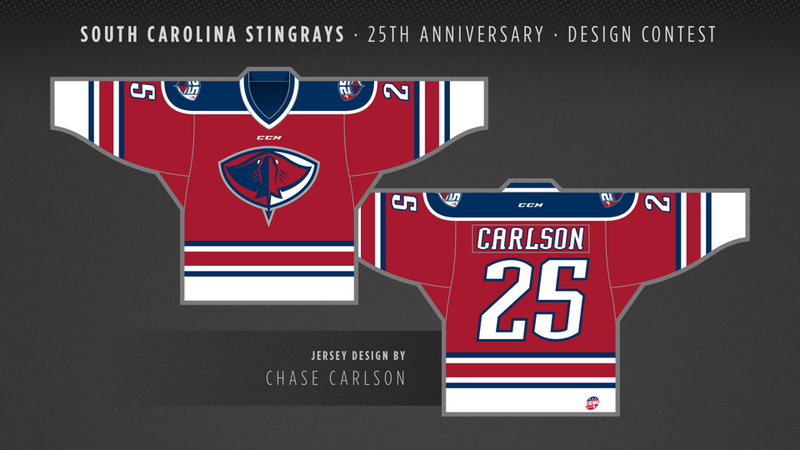 The South Carolina Stingrays were founded in North Charleston as an ECHL expansion franchise in 1993. The team won its first Kelly Cup championship in 1997, adding two more in 2001 and, most recently, in 2009 — the debut season of their current logo package. The venerable Joe Bosack Co. was hired to redesign the Stingrays' identity in 2008. Then in 2012, Icethetics named it one of the five best minor league logos of all time! At the same time, Icethetics named its predecessor the worst minor league logo of all time. But the team's original logo from 1993 remains a classic among minor league hockey logos — a clever blend of state and stingray, who clearly doesn't need hands to handle a hockey stick! The Stingrays' 25th anniversary logo will be the club's fourth commemorative season mark. Here's a look at the three that have come before. Noteworthy alumni include NHL goaltending stars Michal Neuvirth, James Reimer and Braden Holtby. As of today, 32 former Stingrays have advanced to the NHL and one, Rich Peverley, has won a Stanley Cup championship. Now you're all caught up on the Stingrays. Good luck!